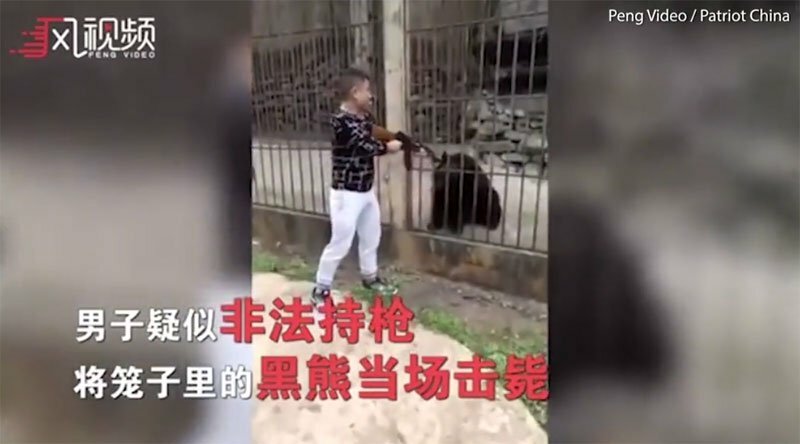 Chinese video showing a man gunning down a caged bear triggered outrage. Chinese police said the brutal video showing a man gunning down a caged bear was shot in Myanmar although the killer was Chinese, after the video went viral and triggered online outrage, Mizzima News carries a report by Global Times.. Scenes of suspected bear parts and men butchering the dead animal were shown in the video. Chinese comments like “Way to go,” “Hurry up” could be heard. Forest police in Xishuangbanna Dai Autonomous Prefecture, Southwest China’s Yunnan Province, told The Beijing News that the video was shot in neighboring Myanmar and that the killer in the video was a Chinese national from Shandong Province. The bear had injured two villagers in Myanmar’s Wa State where he runs a hotel, said Zhang Lin, who killed the bear. The bear was caught by Myanmar soldiers and was supposed to be killed, he said. He told The Beijing News that he was just helping with the execution out of curiosity and wanted to show Chinese visitors the area was safe. The dead bear was thrown into the forests “to scare off other bears,” he said. Zhang said he wanted to apologize for what he did as the video upset many people in China and killing the animal with a gun in China is against Chinese law and ethics. “A bit too cruel, with a negative impact,” he told The Beijing News. “This incident also greatly affected myself. I hope I’ll be forgiven,” he said.